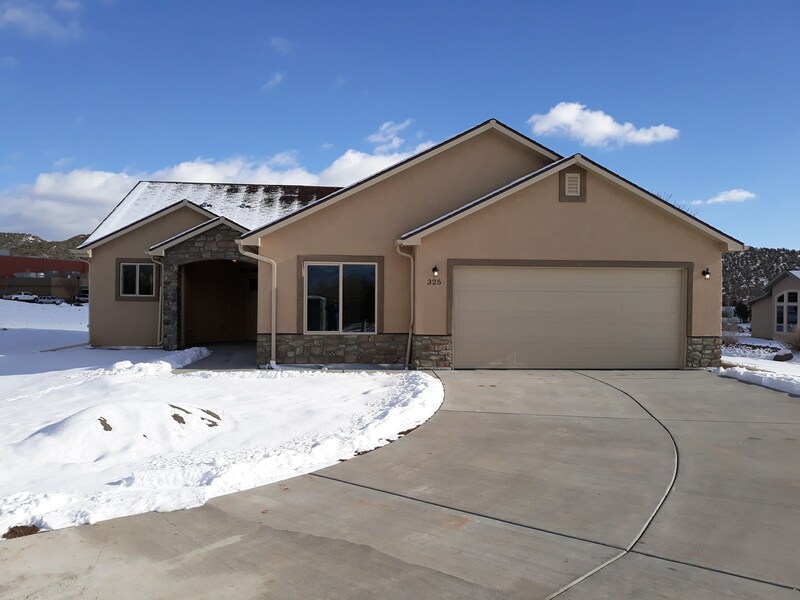 Brand new home in Cedaredge, Co.. Move in Ready! Built by one of western Colorado's premier builders. 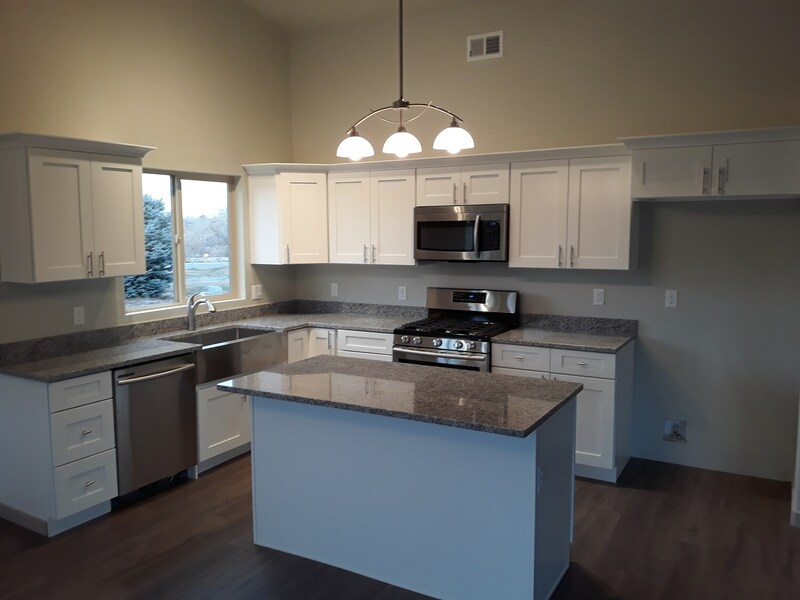 Beautiful well appointed 3 bedroom, 2 bath design on over-sized 1/3 acre lot, located in the very desirable Deer Creek Village Golf Course development. Large great-room design with island kitchen, granite counter tops, and stainless appliances. Large master suite with soaking tub, separate custom tiled shower, spacious walk-in closet, and double sink vanity. Innovative floor plan that locates the 2 guest bedrooms in separate private setting with no shared walls. High efficiency Lennox natural gas heat and central air conditioning. large 50 gallon commercial grade hot water heater. Stucco exterior and 30 year warranty roof. 2 car garage. 10 year Homeowners warranty. This house will be very low maintenance for many years to come! The neighborhood has Ultra High speed Internet from Elevate fiber. All underground utilities. Town maintained paved roads. Very quiet and safe community. Excellent schools within short walking distance. HOA parking facility for boats and RV's at the end of the block. Great views of the Grand Mesa and surrounding area. The Surface Creek walking path is just across the street and the challenging Cedaredge 18 hole golf course is just one block away. 20 minutes to the lakes of the Grand Mesa and miles of groomed Nordic skiing. 35 minutes to Powderhorn ski area. All of these features and priced under $298,000! Myron Anduri is a real estate broker in western Colorado specializing in residential and farm properties. His real estate experience in Colorado spans over 3 decades. As a home builder, he built over 60 residences in the central Colorado mountains. As a real estate owner and investor, he has been a direct party to over 50 real estate transactions involving residences, agricultural properties and raw land. Through it all he has developed a strong sense of what makes a property sell, and has developed a keen eye for purchasing ‘diamond in the rough’ properties. Myron Anduri believes in Western Colorado real estate and is a limited partner in the Cedaredge 1 development adjacent to the Cedaredge Golf Course in Cedaredge, Colorado. The partnership is offering beautiful building lots for sale at very reasonable prices, starting at $25,000 for finished lots with all utilities stubbed in to the lot lines. Creekside lots on Surface Creek are available in the high $30,000's. The partnership plans to offer a line of affordable custom homes on the available lots. Myron offers his construction and business expertise to clients who need an advocate in building their dream home. In 1983 Myron started one of the first solar electric businesses, and has designed and constructed ‘net zero’ homes that produce all the energy they use. Building on that knowledge he spent over 15 years as a corporate sales and marketing executive in the alternative energy industry. As Vice President of New Business Development for Kyocera Solar Inc. he to traveled the world and gained first-hand knowledge of power systems, building alternatives, and complex business contracts. Myron holds a BA in Economics from Colorado State University, with studies in western water law. In addition to his full-time real estate work, he and his wife raise natural beef on their farm in Delta County, CO. If you are looking to sell or purchase real estate, rest assured he has been in your same shoes, many times. If you are looking to sell, he can offer you decades of experience in what helps a property sell. He will offer concise, experience-based suggestions for your consideration when preparing your property for sale. He will also show you how your property will receive unprecedented targeted exposure to the most suitable audiences, nationwide. If you are looking to buy, Myron will work with you one-on one to find that perfect property and offer his proven method of purchasing property at a very fair price. Finding the right property can take time and patience. Working with Myron, you will never feel pressured.